Delhi shelters very large population migrating from various parts of the country. The migrants come and settle in Delhi and NCR region for jobs, higher education, coaching classes for various competitive exams. In the recent years, the crimes in the area are also increasing exponentially. These criminal activities include many pre and post matrimonial cases. The First Indian Detective Agency has launched the services of Matrimonial Detectivesin Delhi for investigation of such cases. It is your right to know about your partner in a fairly transparent way. Getting into a new relationship is not bad but there cannot be any place for a doubt in heart. In the world of online matrimony profiles where most of the conversations are on real time chat, it is not safe to trust a person’s word without thoroughly verifying it. It is not the age where the bride and grooms family was introduced by one trustworthy person. This is the age of internet and social media. With its immense pros, there are cons too that cannot be avoided. How do we check the authenticity of a perfect match? There are many doubts in our minds but nowhere to look for the answers so we go with the flow. Now, the services provided by our matrimonial detectives can give you answers to all of your doubts and queries about the authentication of the partner you are choosing in absolute confidentiality. In many cases, even after marriage, the partners are found to be cheating in their marriage and breaking the holy laws of the wedlock. There are several issues related to marriage. There might be some suspicious activities you cannot question directly as it could have serious fall backs and affect your married life but your mind needs to have a clear picture and should not be in suspicion. 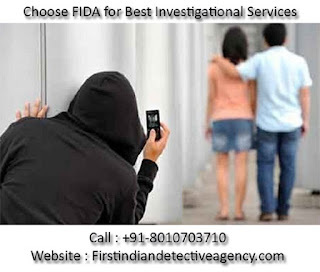 If you think your partner is having an extra marital affair or any information regarding finance or family is kept from you, hire FIDA detective agency and find out the truth behind all the suspicious activities. With a team of our highly skilled and industry experienced private investigators, we provide all sorts of matrimonial investigation ranging from background checks to sting operations in required cases. Our investigators provide you with fast investigation report with legal proofs and evidences if required. The First Indian Detective Agency follows a strict code of conduct and work ethics. We keep the investigations private. We understand the tenderness and complexity of the matter and work according to the requirements of the clients. FIDA works on complete secrecy policy and keep all the investigation findings in privacy just between the client and the company. We don’t keep the copies of the evidences and proofs after handing them over to our clients. We assure you to maintain the quality of investigation along with its codes of conduct. For any Matrimonial detective services, contact FIDA INDIA and get your doubts out of your mind and live peacefully and happily.